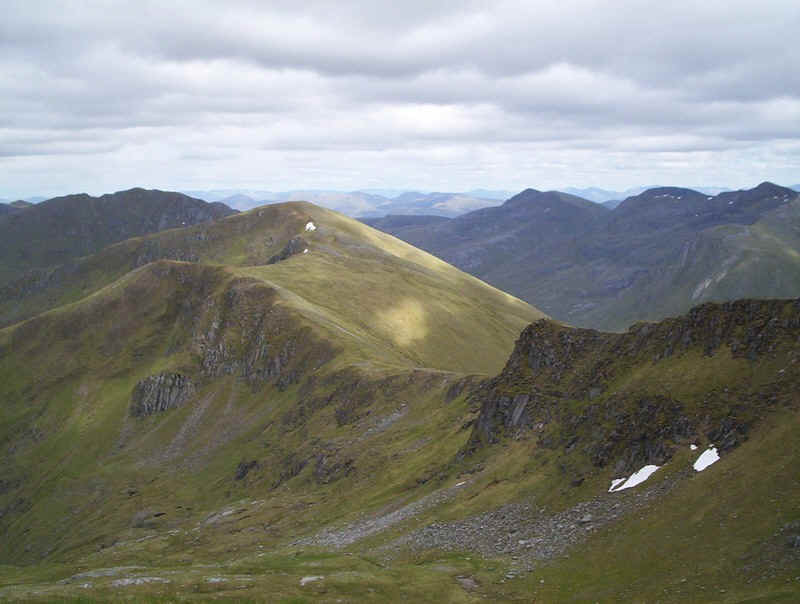 Having walked the eastern half of the South Glen Shiel ridge, the following day I tackled the western end. 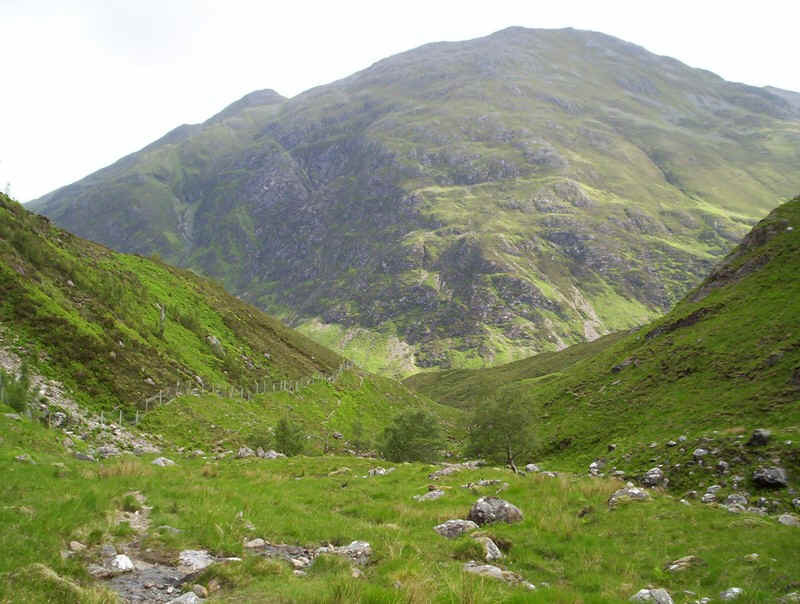 As I was staying at the Cluanie Inn (highly recommended by the way for good rooms and food as well as friendly staff) I used their "taxi" service to reach the start of the walk at the lower end of Glen Shiel. 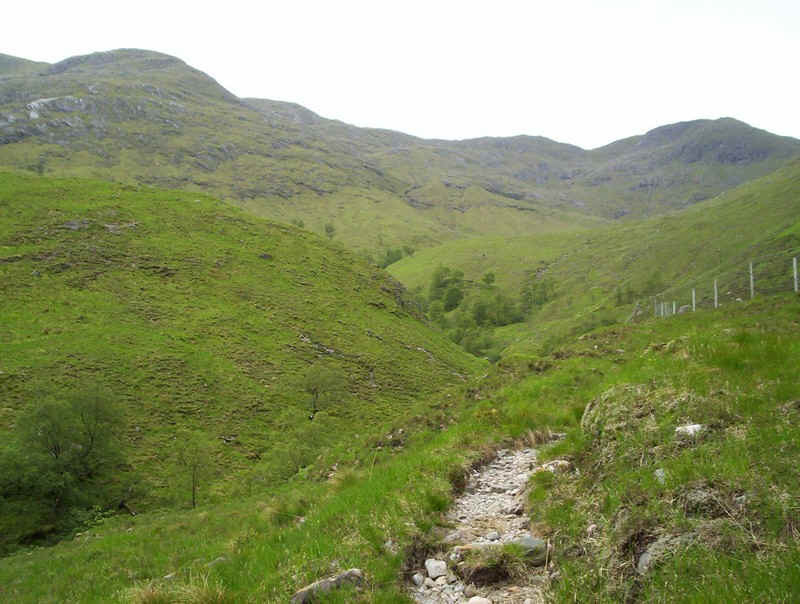 The owner of the inn took three of us down in his Land rover but, rather than starting from the forest near the Glenshiel battle site, he suggested we start the walk near Malagan Bridge where there is a good path, which climbs up to the ridge. Who was I to argue with his recommendation? The photo below shows the start of the walk at Malagan Bridge with Sgurr a Chaulinn and beyond the bealach leading to Creag nan Damh, the first Munro of the day. If you right click and then select "open in new window" you should be able to switch between the map and the walk description. It was a superb morning with clear skies but pleasant cool. 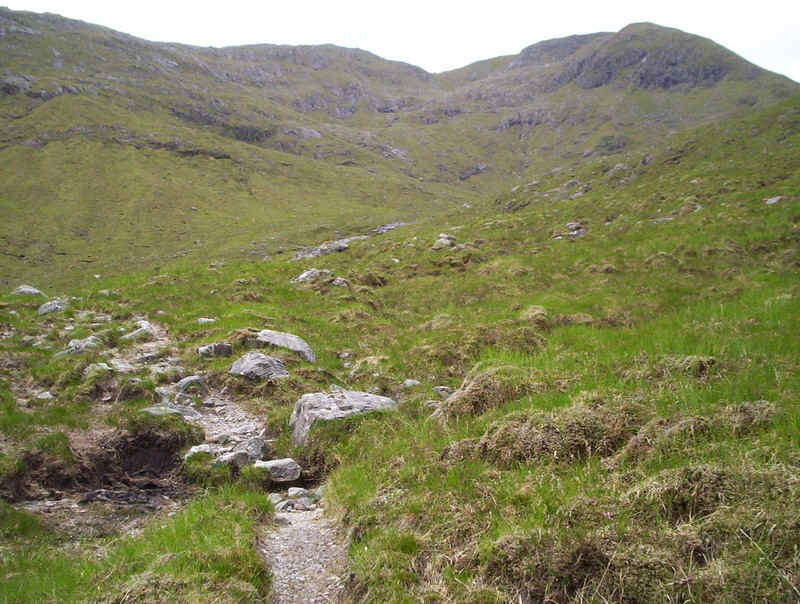 Here the path is heading up by the Allt Mhalagain. When walking up a valley it's easy to forget to look backwards. When I turned round this was the magnificent spectacle; Sgurr na Ciste Duibhe on the Five Sisters Ridge. 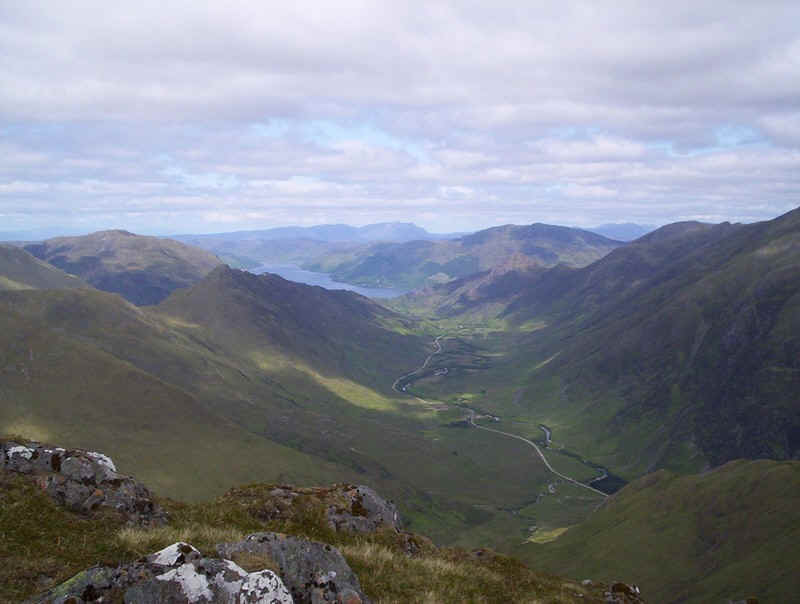 with Glen Shiel deep down below. Further up the valley Bealach Duibh Leac in the centre and Sgurr a Bhac Chaolais on the right come into view. Somewhere about here I made a mistake in my navigation. Come to think of it, so did at least four other walkers that day. Not having looked at the map as closely as normal I managed to loose the path as it turned eastwards towards the bealach. 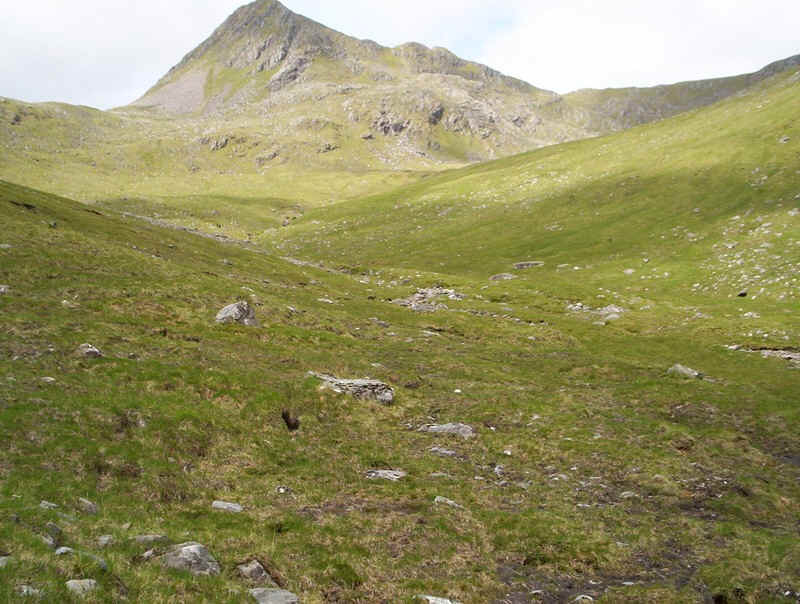 I was also distracted by another walker and we fell into conversation as we continued into Coire Toiteil. 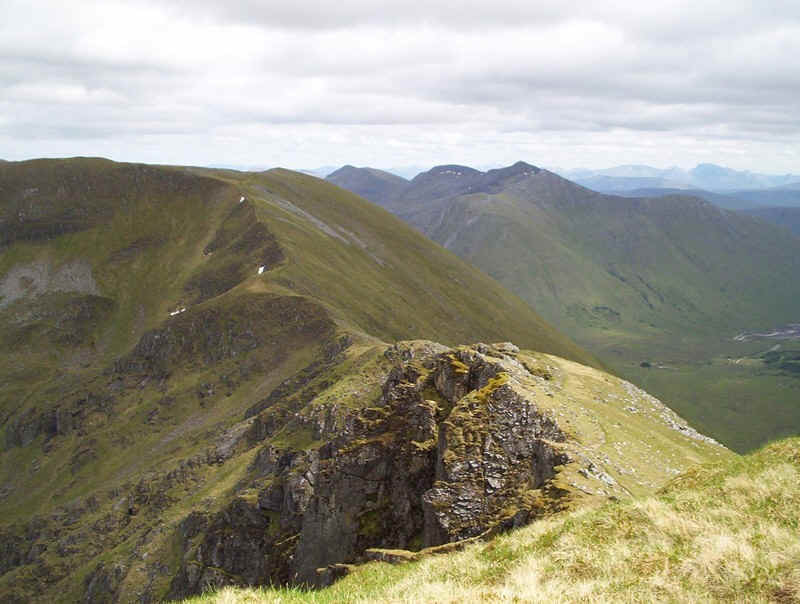 In the photo another Munro, Sgurr na Sgine, appears. It was here, as the other walker hurried on to meet his girlfriend and dog that I realised my mistake. My GPS gave me a position nowhere near where I expected to be. Moral of this is concentrate and keep checking the map! Rather than do the sensible thing and turn back, I decided to head for Bealach an Toiteil and climb Sgurr a' Bhac Chaolais on my way to Creag nan Damh. The head wall of the corrie was up steep grassy slopes but I was at the bealach two and a quarter hours after leaving the road. The reward was this view looking back towards the Five Sisters. From the bealach I took a series of photos which I've combined into this panorama looking south westwards towards the area known as the Kinloch Hourn Forest. Click on the image for a larger view. 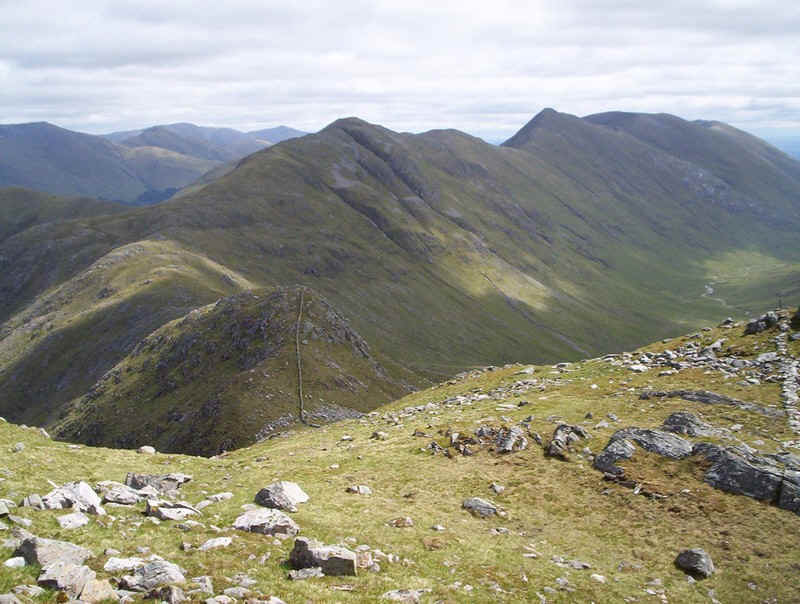 From the bealach I turned east to meet this sight - the craggy slopes of Sgurr a' Bhac Chaolais. I uttered a few choice swear words as clearly there wasn't going to be an easy way up this hill. I was amused, however, to hear the other two walkers I'd had a lift with had also taken the wrong path. I heard the man shout to his wife, "We've come up the wrong valley!" There's a line of fence posts and walls that run right across this Corbett so I decided the best course was to follow these. Needless to say the went straight up the cliffs. 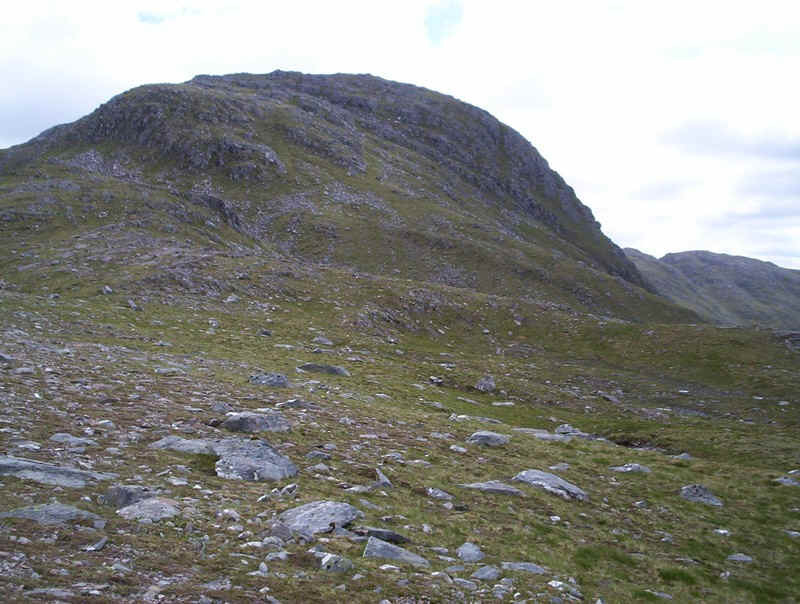 They headed straight for an area of scree boulders, seen close to the left of the photo and just below the crags. Having crossed this it was obvious that others had found a way up this way. It was an "interesting" climb to say the least. Viewed from the slopes of Sgurr a' Bhac Chaolais and looking across Bealac an Toiteil Sgurr na Signe looks pretty impregnable from this side. 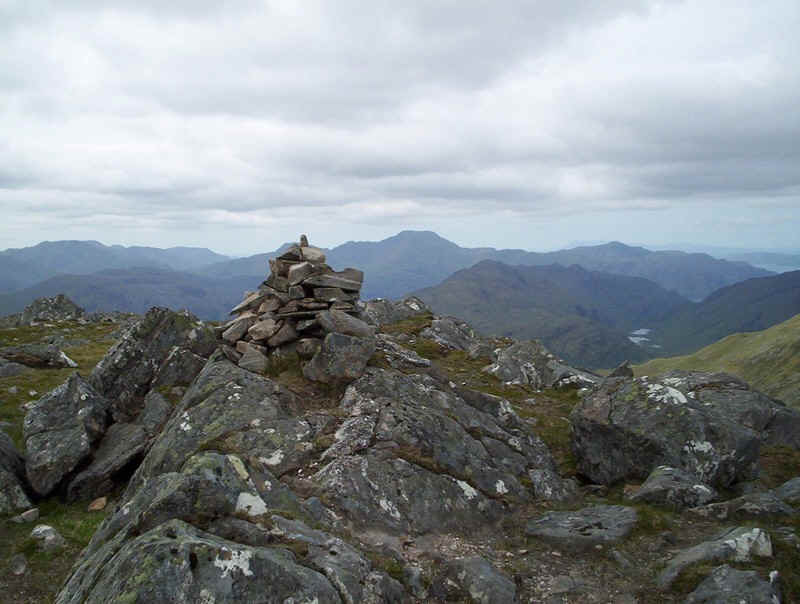 After a climb of just over half an hour I reached the summit cairn of Sgurr a Bhac Chaolais (885m). 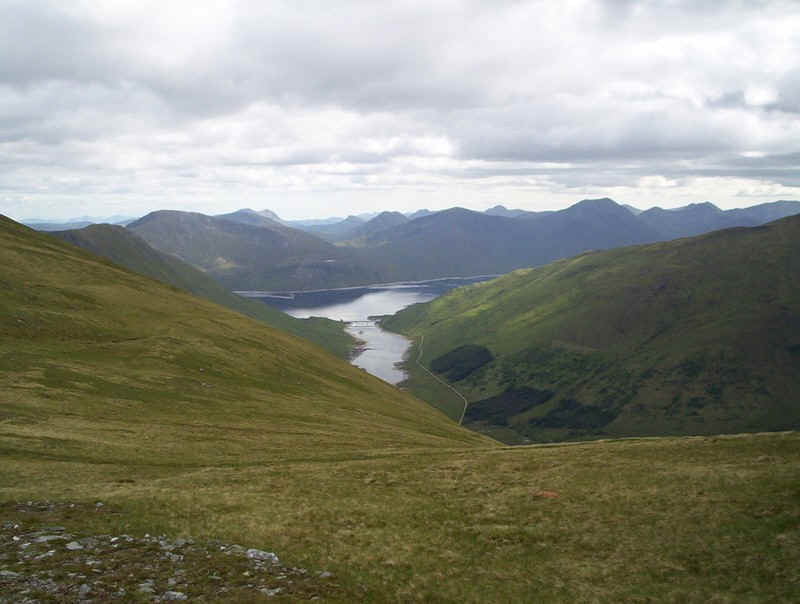 To the right can be seen the two small lochans in Glenn Dubh Lochain and beyond Loch Hourn. 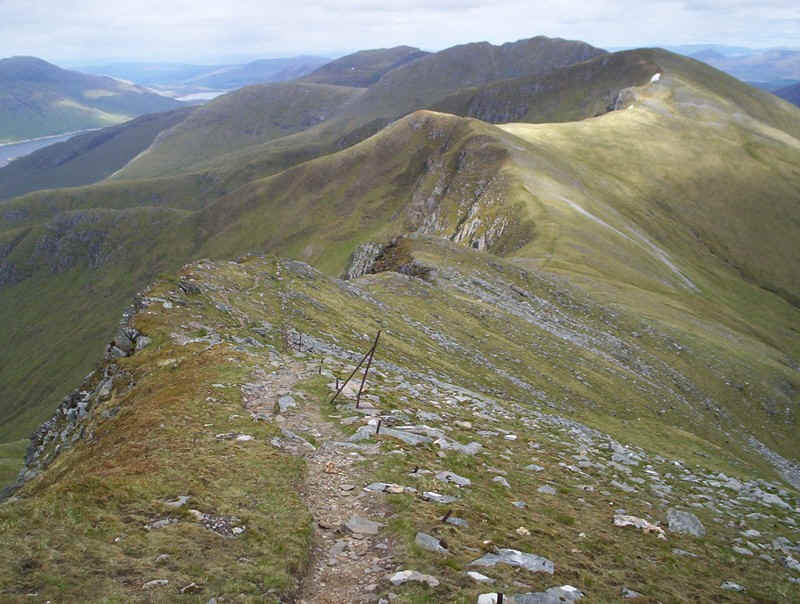 In retrospect, I'm quite pleased I made this navigational error as it meant that I'd climbed another Corbett and, perhaps more to the point walked along the entire South Glen Shiel ridge and not just the section with the seven Munros. From the summit I took another series of photos which I've combined into a panorama, showing The Saddle in the left distance and the Five Sisters to the right. Click on the photo for a full sized image. 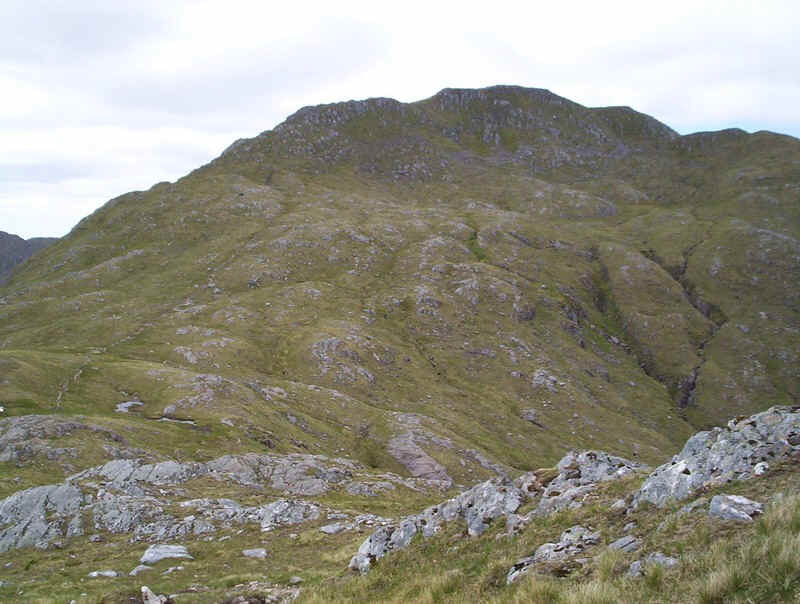 It had taken me three hours to reach Sgurr a'Bhac Chaolais. After a break for lunch it was time to move on, thinking I wouldn't encounter any more obstacles to rapid progress - wrong! The way forward along the ridge from Sgurr a'Bhac Chaolais can be seen here, with the summits of Creag nan Damh, Sgurr an Lochain and in the distance Sgurr an Doire Leathain. 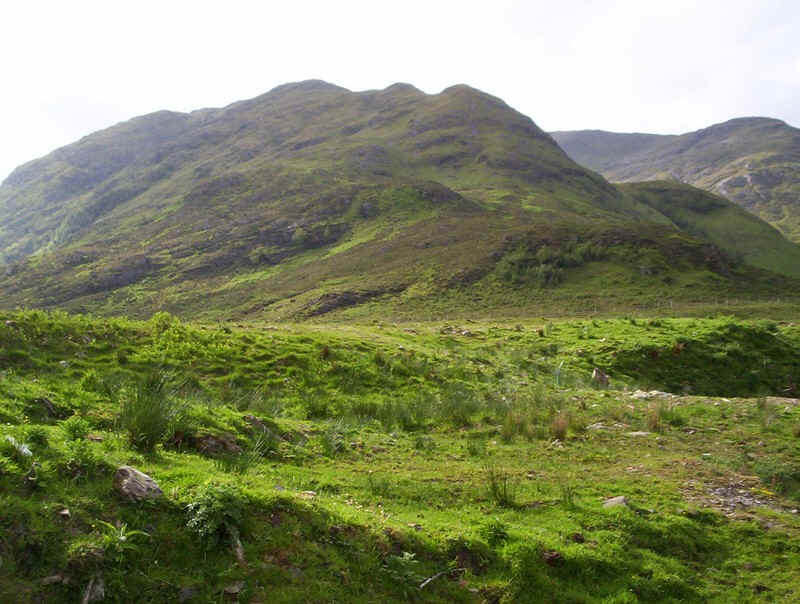 There's an obvious track down hill to Bealach Duibh Leac following the wall and fence posts. 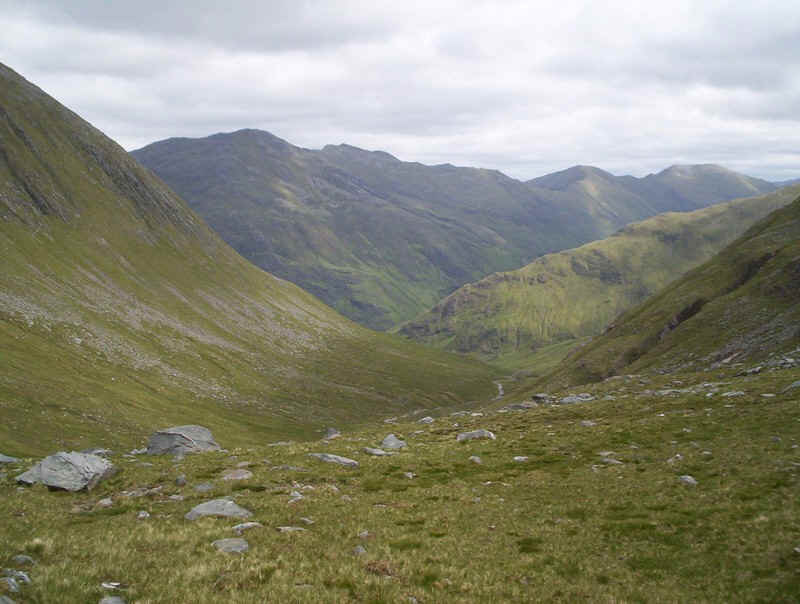 Looking down Wester Glen Quoich from Bealach Duibh Leac. 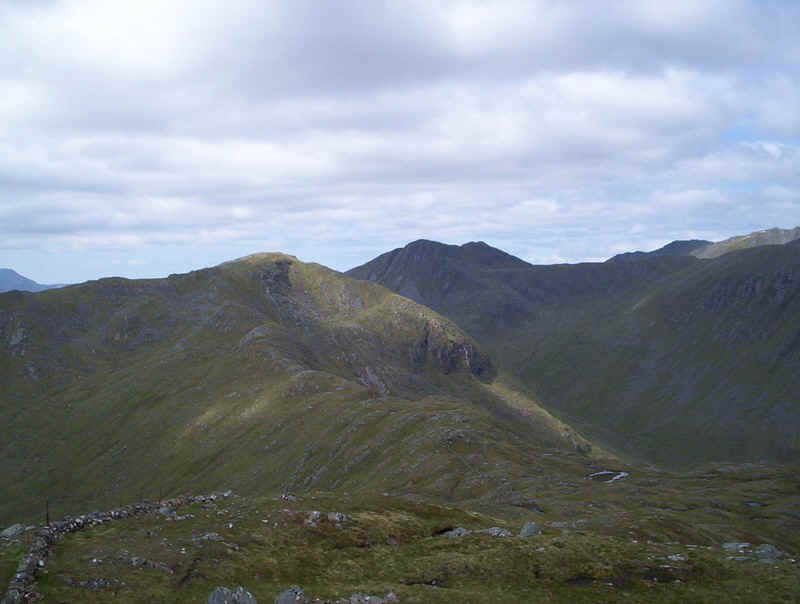 Looking back along the ridge towards Sgurr a Bhac Chaolais. The track suddenly appears on top of this outcrop. There's an "interesting" section down quite a long gully, which required me to throw my trekking poles down hill and wriggle stretching for footholds. Great fun! 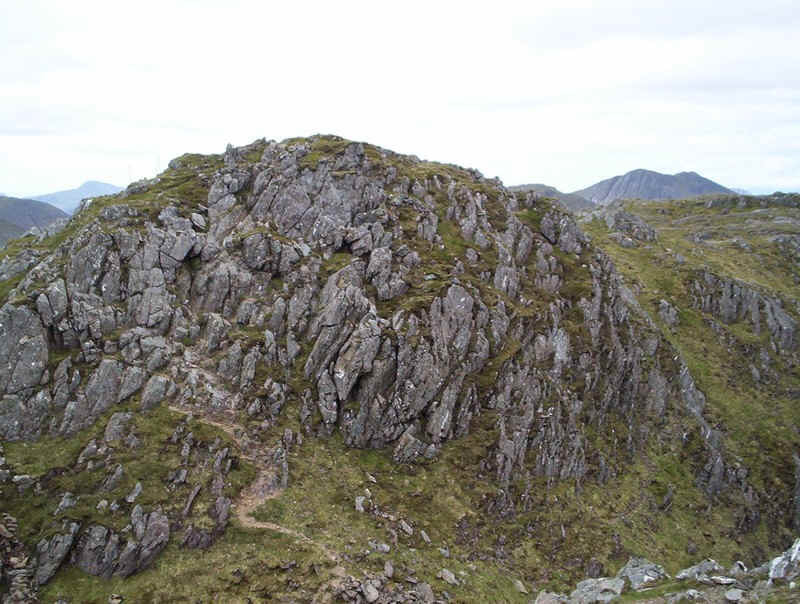 It took me about an hour and a half to reach Creag nan Damh's cairn (918m) from Sgurr a Bhac Chaolais. 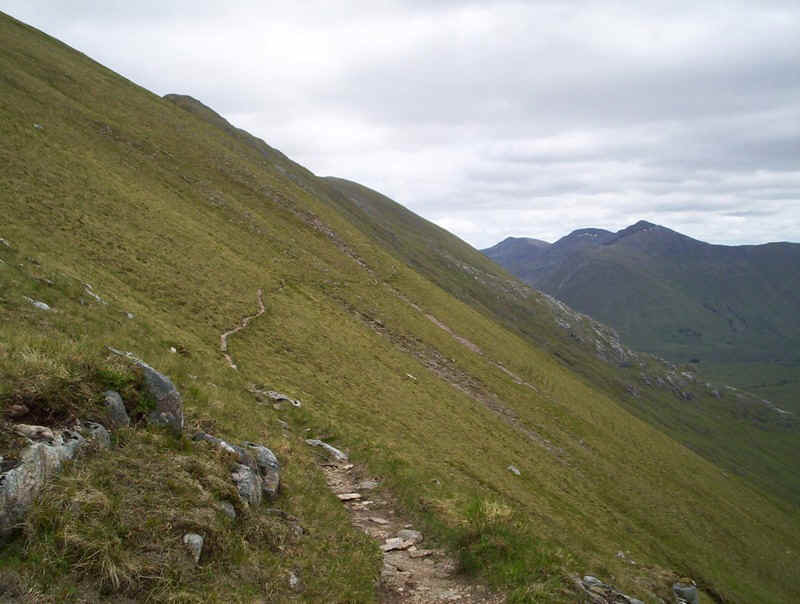 After another short break it was onwards towards Sgurr an Lochain. That's the pointed one in the middle of the photo. 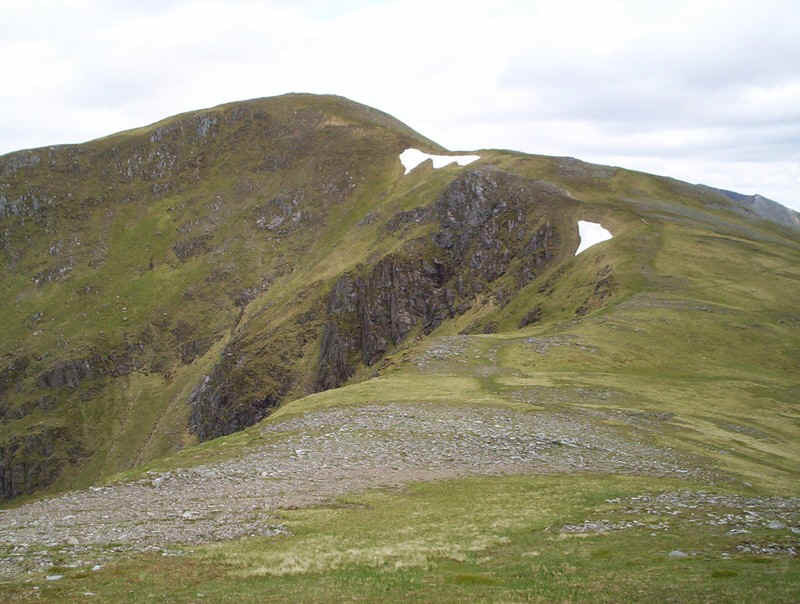 There's a long drop to Bealach Fraoich Choire at 729m. 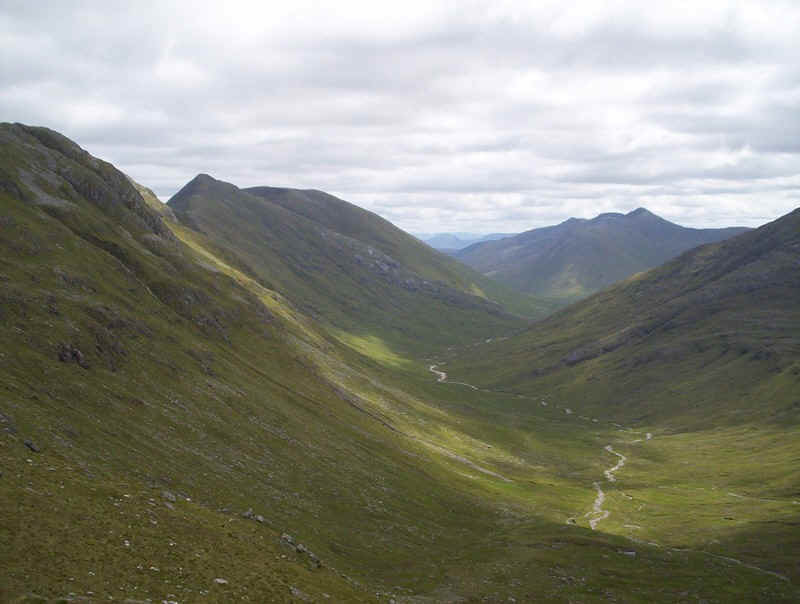 The photo shows the route looking back towards Creag nan Damh from the bealach. 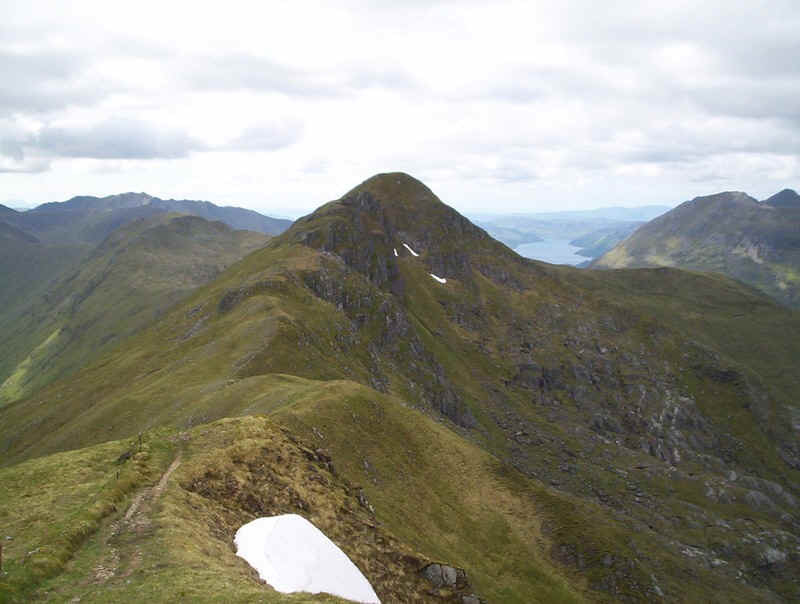 It had been my intention to go over the top of Sgurr Beag but clearly I was running later than intended and the extra ascent of about 150m didn't appeal so I took the bypass path below Sgurr Beag. To my surprise, despite being on a steep slope, the path itself is absolutely level and was a delight to walk on. 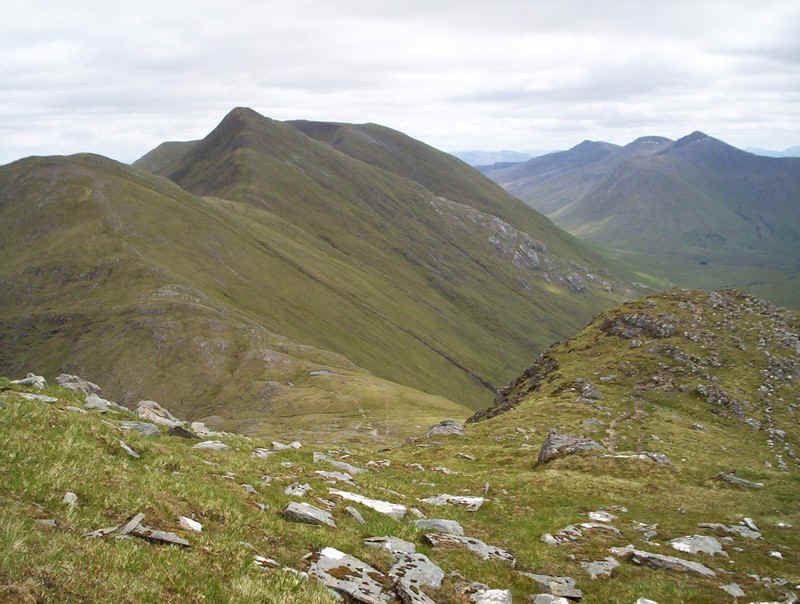 Beyond the next bealach, Bealach a'Choire Reidh there's a climb up to the next Munro Sgurr an Lochain. Looking back towards Creag nan Damh on the right and Sgurr Beag. 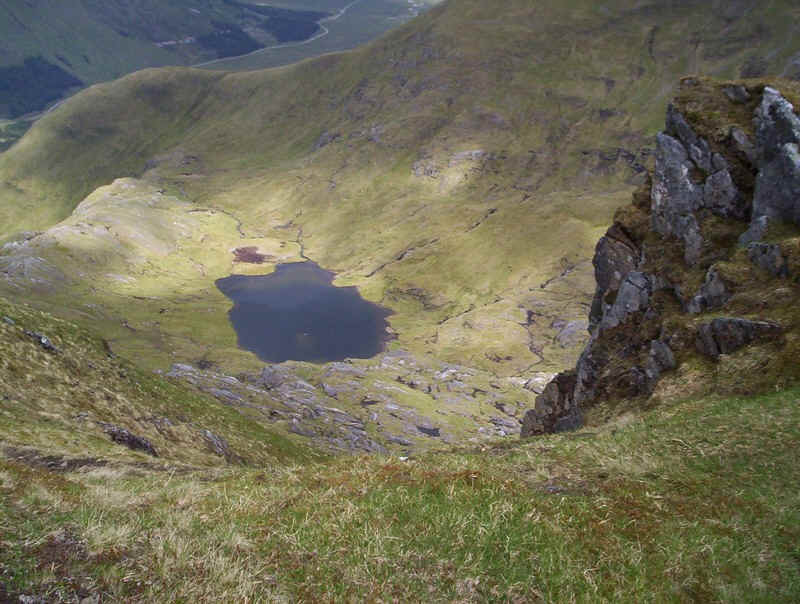 Beyond Sgurr an Lochain (1004m) the path drops down to Bealach Sgurr an Leathain at 881m. 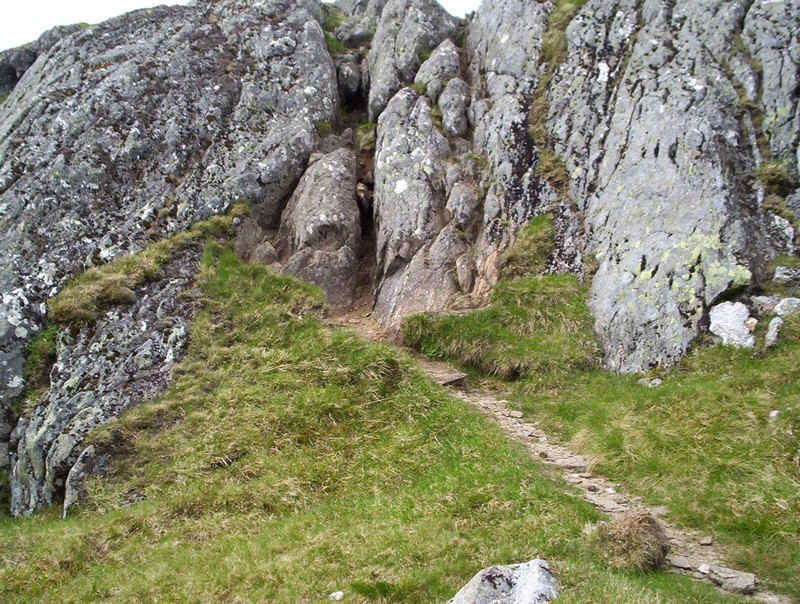 Here is the way forward seen from the summit. On the way down to the bealach there are superb views down into Coire an Lochain. There is one difficult section on this descent. What the guide books don't tell you is that there's no need to clamber up or down this bad step. 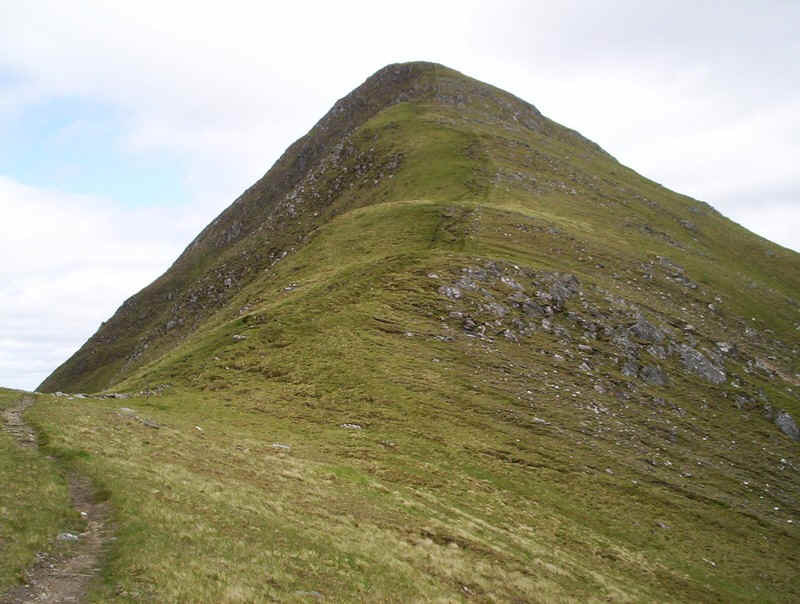 Simply walk around it to the south over grassy slopes! This photo shows the scrambly bit looking back westwards. 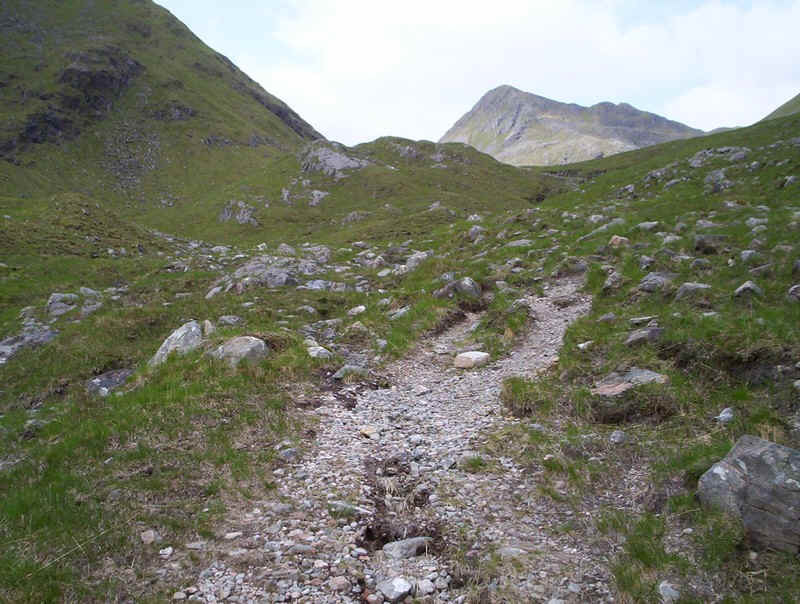 The path now continues in a wide sweep around Coire an Lochain to approach the next Munro of Sgurr Doire Leathain. 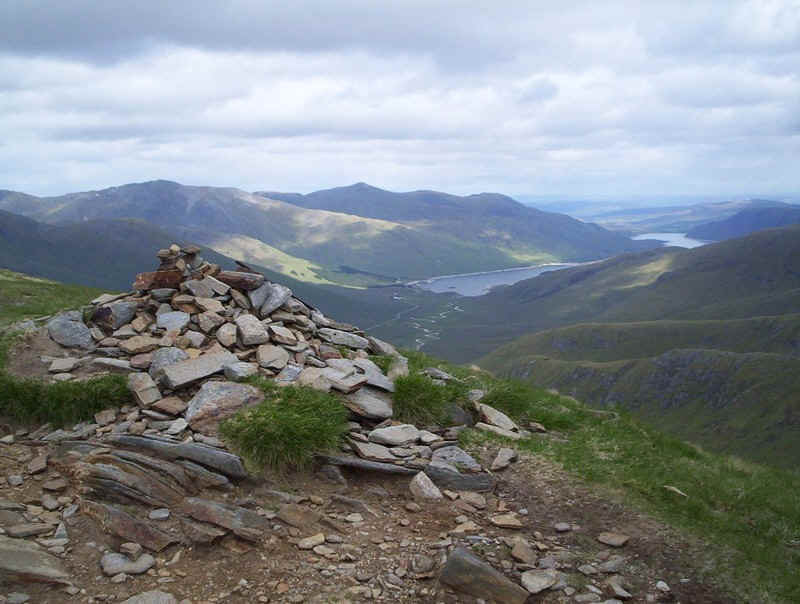 Sgurr an Doire Leathain's cairn (1010m) with Loch Cluanie beyond. With my usual dawdling progress, taking photos, stopping to chat to the occasional walker and have plenty of snacks it had taken me just over seven hours to reach this point. The views had been tremendous; The Cullin ridge, Canna, Muck, Eigg and Rum and even the hills on Barra and South Uist being clearly visible. 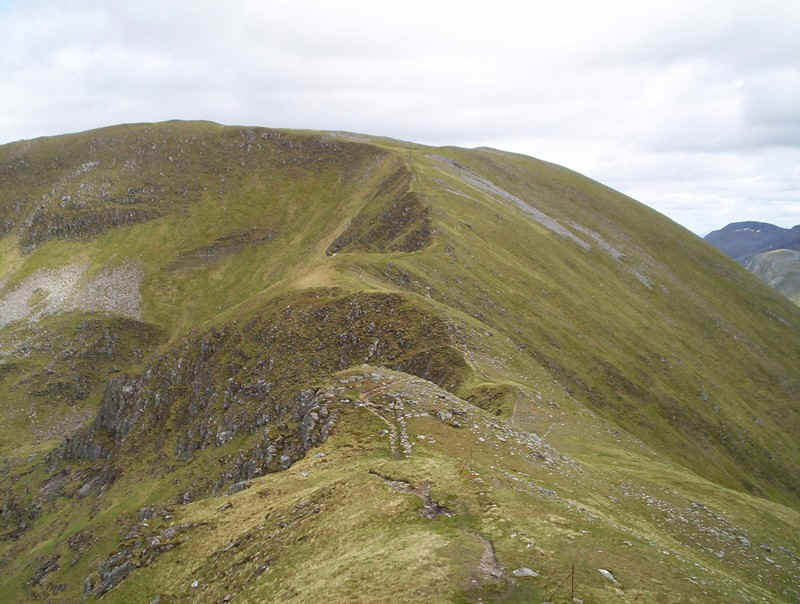 The final stage of the ridge walk was the continuation on to Maol Chinn-dearg. 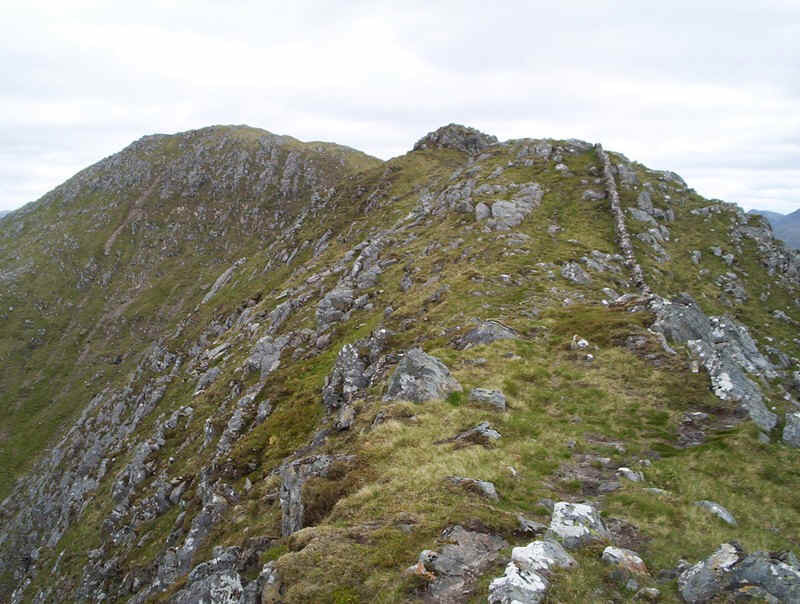 Sgurr an Doire Leathain's summit is slightly off the main ridge. 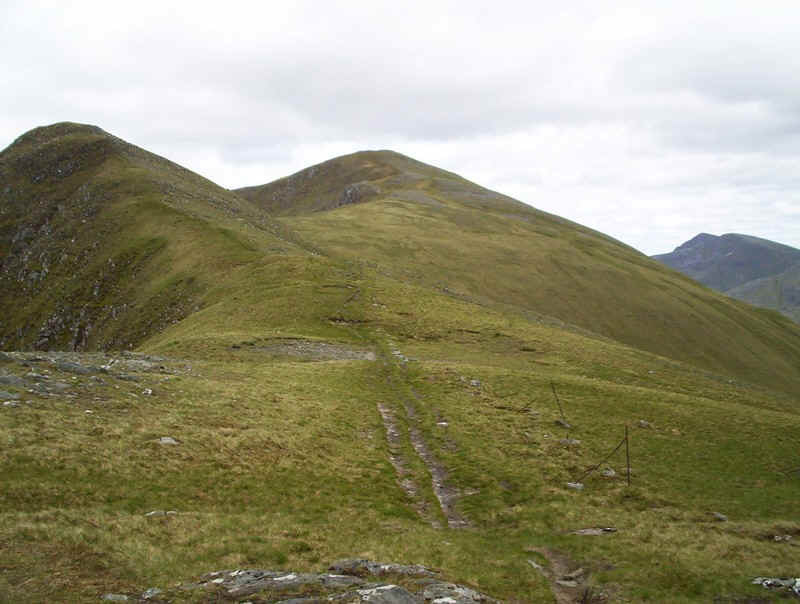 The main path's meet at this junction a few hundred metres from the summit; to the right westwards whilst to the left eastwards. It's probably easy to miss in misty weather. 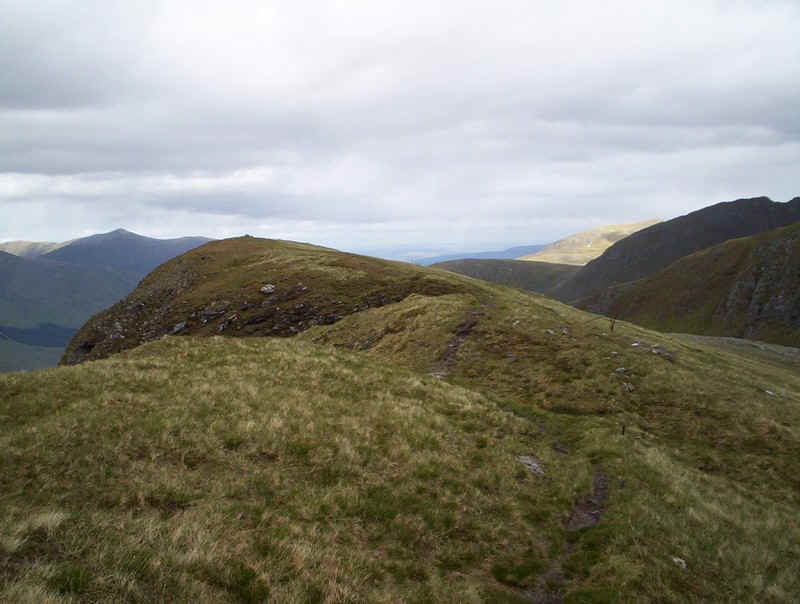 On the descent to Bealach Caol na Droma Moire there's another hazard - sawn off fence posts sticking out of the ground. In snow or poor light this could be a real trip hazard. Good job the health and safety people don't come up here too often!! Perhaps we should ask for a yellow sign? Having avoided the summit of Sgurr Beag I found myself climbing up Sgurr Coire na Feinne instead of taking the by pass path. 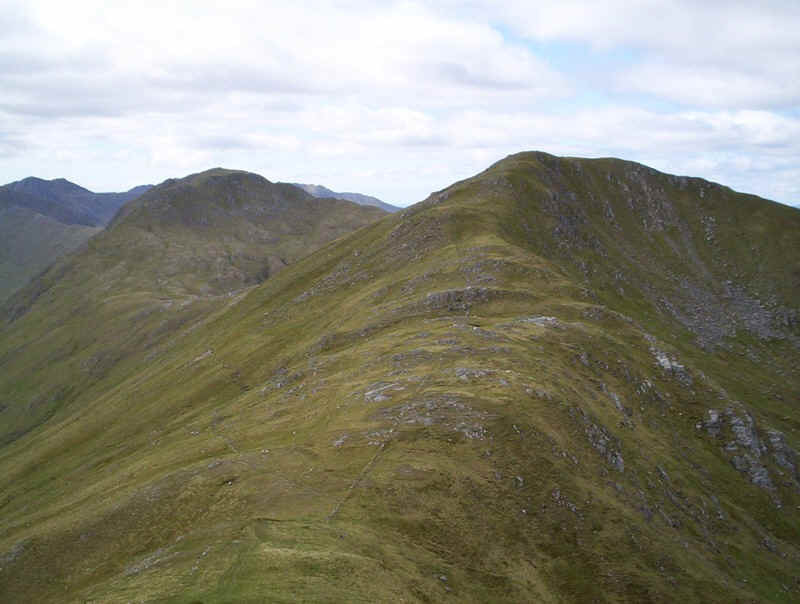 The ultimate Munro on today's walk, Maol Chinn-dearg is to the right. Having been tempted away from the main path I decided to head for the summit of Sgurr Coire na Feinne - in truth it's nothing more than a slight swelling but there is a good view over Loch Cluanie. 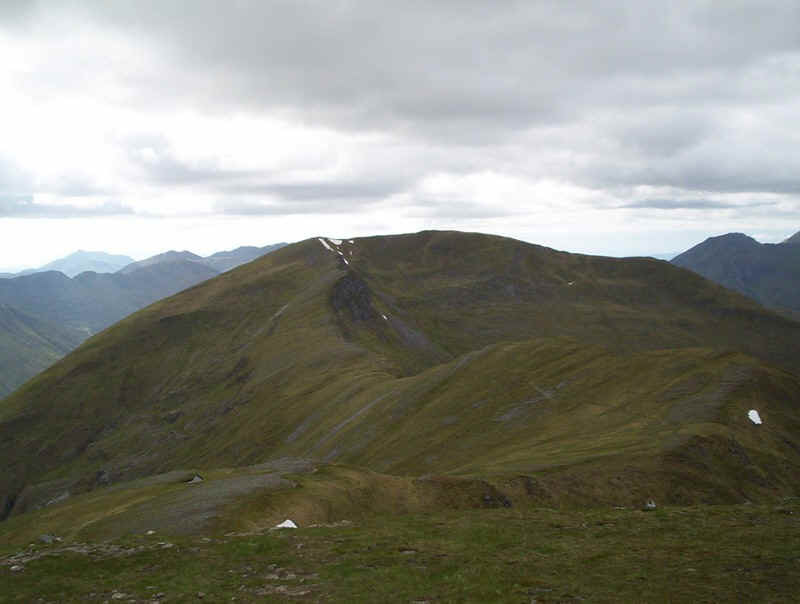 The final Munro of the day, Maol Chinn-dearg (981m) is approached up gentle slopes. 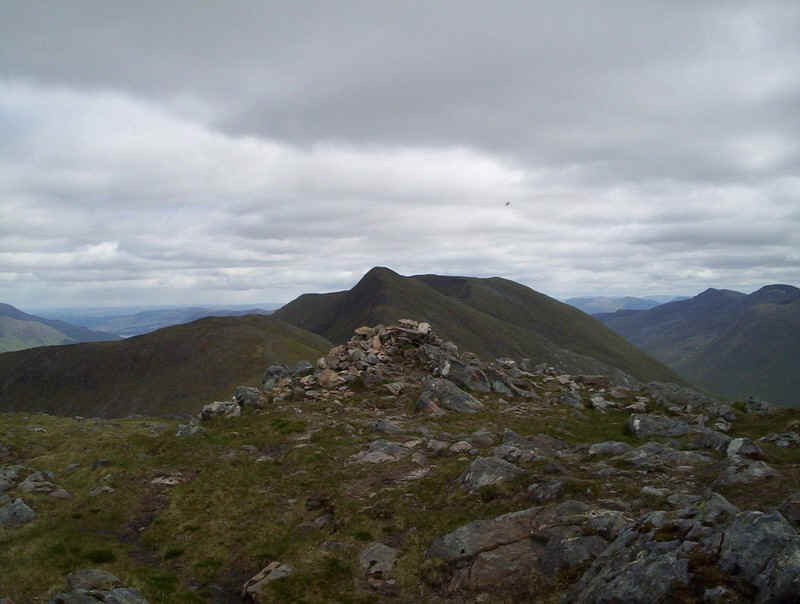 So far this is the only Munro I've climbed twice, having ended the eastern half of the South Glen Shiel ridge at this point the day before. It had taken me just over eight hours from the start of the walk to get to this point. Given that I'd taken about sixteen hours in total to walk the entire ridge I'm full of admiration for those who manage it in one day's walk. Mind you, now that I've taken all those photos and know the route I think I could almost match those times. 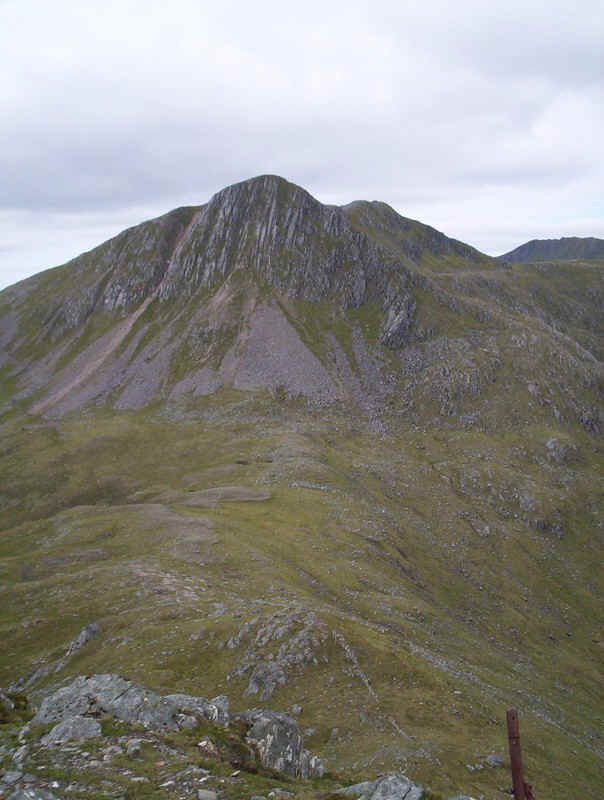 However, for me walking isn't about covering as much ground as possible it's about the "mountain experience"
Here there's a final look at the ridge looking back back to Sgurr Doire Leathain. The mountains beyond Loch Quoich are reflected in its waters. 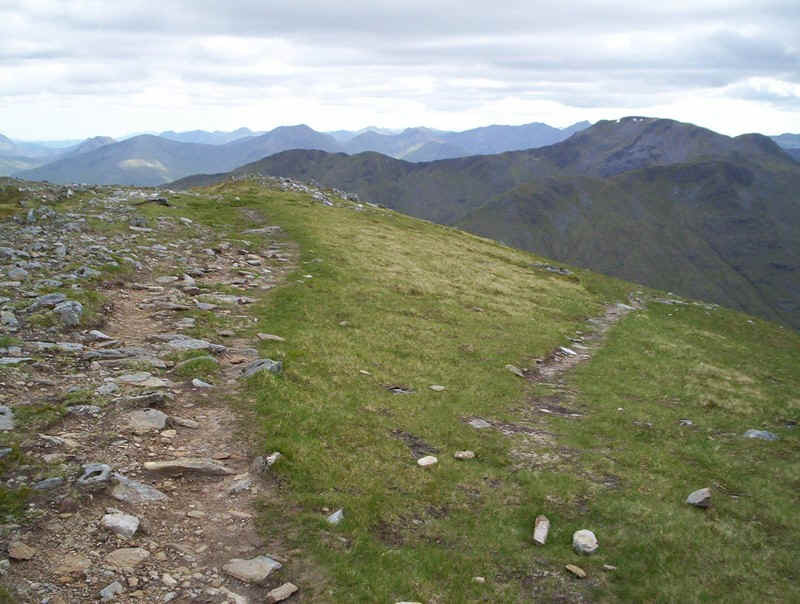 The final section of the walk down to Glen Shiel has been covered in the page covering the eastern half of the ridge walk.